Welcome to our stop on The Girl from Everywhere tour for Heidi Heilig. This tour is hosted by Rockstar Book Tour. When I was fifteen, I fell desperately in love with a boy I saw across campus. 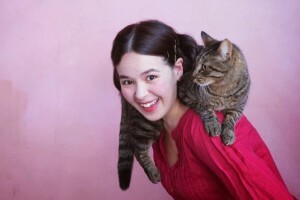 At 17, I moved away without ever telling him how I felt, and for the next five years I regretted that. Thankfully my own story has a happy ending, but ever since then, I’ve been obsessed with regret and time travel and true love, and it shows in my writing. 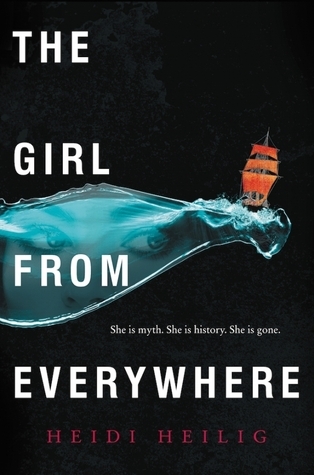 THE GIRL FROM EVERYWHERE is a story about Nix, who lives aboard a time travelling pirate ship. Her father uses maps to journey to places out of myth and history, but all he really wants in the world is to go back to 19th century Hawaii to save her mother, who died in childbirth. Of course, this puts Nix’s entire existence at risk, not to mention her relationship with her best friend, the charming thief Kashmir, who she met in a mythical version of Persia. She has to decide whether to help save her mother’s life at the risk of erasing her own. I’ve always loved impossible dreams or against-all-odds quests. Characters who are facing almost certain defeat and yet still set out on the journey are my very favorite sorts. Which character in your book can you relate to the most, and why? While the main character, Nix—a half-chinese lover of history and myth—is definitely an aspect of me, the character who is most relatable is actually the opium addict and terrible father, Captain Slate. He’s bipolar, like I am, and lets his passions get the best of him, careening from wonder to despair. And in spite of it all, I hope he’s forgivable by the end. My husband was in the room already, as was his old college buddy Tomm, who was staying with us on a visit from California, but after I screamed the news at them, I called my mom (of course!) She’s the one who encouraged me to follow my passion. She’s also the smart one who told me I should try to get an agent and actually get published (I had written the manuscript “just for fun.”) She’s a fantastic inspiration, a very smart business person and an amazing writer herself—I had to share the news with her. Sir Terry is a perennial favorite, though I could never be 1/100th as hilarious as he was. But I loved his absurdist take on things, and how most of his themes were so poignant: you were laughing as your heart broke. 2 winners will receive a finished copy of THE GIRL FROM EVERYWHERE. US Only.